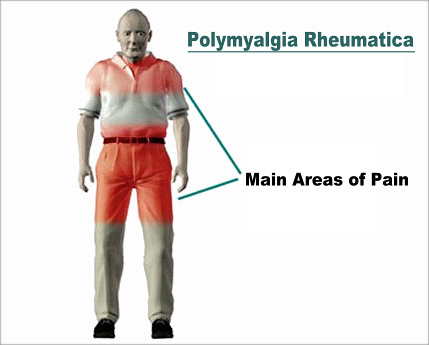 Polymyalgia rheumatica (PMR) is a condition affecting the muscles. It causes pain and inflammation and is named after many (poly) painful muscles (myalgia). It affects men and women equally, and is most common over the age of 50. Despite extensive and ongoing investigations, its cause remains unclear. It is different to rheumatoid arthritis or any other type of joint or muscle inflammation. 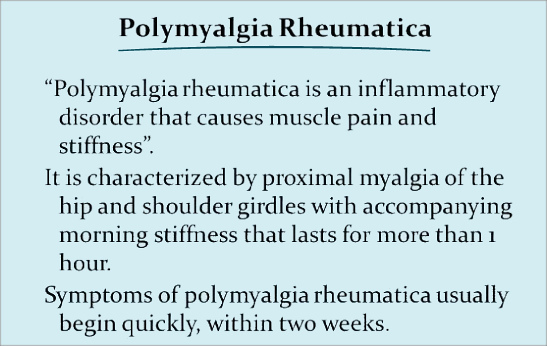 What Are The Signs And Symptoms Of Polymyalgia Rheumatica? Symptoms can occur suddenly, over the period of a few days, and are sometimes linked to a recent 'flu - like infection. There is pain and stiffness in the muscles - especially of the thighs and shoulders - which is much worse in the morning and on getting up. The pain can be severe, and make getting out of a car or rising from a chair difficult. The muscles can feel weak and there may be difficulty going up stairs or walking as a result. It is also common to feel generally unwell, lose a little weight or have a temperature. Some people find they have a headache, or very tender temples. This is due to an associated inflammation of the arteries of the scalp, called temporal arteritis. The temples and scalp are tender to the touch, combing the hair may be uncomfortable, and chewing may cause discomfort on the affected side. Yes. Your doctor will take some blood for testing, especially for an erythrocyte sedimentation rate (ESR) test. This test measures how quickly red blood cells settle at the bottom of a test tube - the sediment. The quicker it settles, the greater the inflammation so someone with PMR will have a high reading. Most doctors feel that a reading of 20 or more is significant, although it rises with age also. At the same time, other illnesses will be looked for from the blood such as anaemia, rheumatoid arthritis and thyroid problems. On occasions your GP may order some X-rays - such as on the neck or shoulders - to make sure there are no other conditions such as osteoarthritis present. The mainstay of PMR treatment is corticosteroids. Our bodies produce these naturally, but the treatment is in much higher doses than normal. They are extremely effective (namely prednisolone), often at a starting dose of between 10mg and 15mg per day. They may be prescribed as an 'enteric' form - the tablets are coated to protect the stomach from irritation - and can reduce symptoms dramatically, sometimes within hours. Your doctor will monitor your progress, usually with regular blood tests, and aim to reduce your prednisolone by 1mg every few weeks. Each person with PMR reacts differently to steroids, so each treatment has to be tailored to that person, but in general improvement often becomes slower as the dosage falls. It is important to remember that steroids do not 'cure' PMR. They are simply very good at reducing its symptoms while it settles naturally. The majority of PMR sufferers are able to recover completely and be tablet-free within 12 months of starting treatment. A small percentage require low-dose steroids for longer and sometimes for life, but are able to lead a normal, active lifestyle with no symptoms. Occasionally, someone who has had PMR in the past may have a second episode, but recognise the symptoms and so seek treatment quicker than previously. If there are symptoms suggestive of temporal arteritis, it is important this is treated rapidly and with higher doses of prednisolone than usual, since blurred vision, double vision or permanent sight problems (including blindness) can occur if left untreated. Arteritis responds very well to steroid treatment. If you are taking steroids, it is important not to suddenly stop taking them without seeing your doctor. It is best to rest in the early stages of PMR, since exercise puts an added strain on the muscles and so the dose of steroids may need to be increased accordingly. Once the PMR is settling, it is quite safe to exercise again. 1. Have you ever had these symptoms before? 2. Are they worst early in the morning? 3. Is it physically difficult to get out of bed or a chair? 4. Do you have any problems with headaches or your eyesight? 5. D you remember having fflu or a cold just before you noticed your symptoms? 1. How long will I need to be on treatment for? 2. What are the side effects of steroids? 3. How severe is my PMR? 4. Am I more likely to get other forms of arthritis in the future? 5. Will any natural treatments help?